The smell of sweat fills the tiny room of screaming fans. Two boxer bob and weave in a miniscule ring, desperately attempting to bring each other to the ground. The primitive intensity of the fight continues to elevate, as fans can almost taste the tension in the pungent, sweat-filled air. Fatigue begins to set in on the opponent as his limp body starts to give into to the mighty bought. An ultimate look of fear sets in the opponent's eyes as Jack Dempsey's fist comes flying towards his face. His eyes close as a powerful and ferocious blow ensues. The opponent's body crumbles to the floor, his last recollection is being the bell sounding Jack Dempsey's victory. This was the scene was the commonality for many boxers who faced Jack Dempsey in the 1920s. 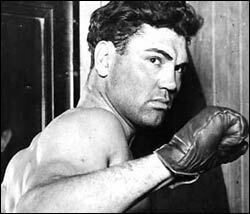 Born in Manassa, Colorado on June 24, 1895, William Harrison "Jack" Dempsey rose to sports stardom in the 1920s. As a nomadic traveler from 1911 to 1916, Dempsey began boxing in the small mining towns of Colorado under the name "Kid Blackie." He emerged from numerous saloon floor-boxing matches to rein victorious in over 80 professional fights by the meager ago of 24. Dempsey was perhaps best known for his thrilling knockout victories, many of which occurred in just seconds of the fight�s onset. Dempsey proved his phenomenal ability in a battle of "David and Goliath" match of fists. His iron strength and killer left hooks allowed Dempsey to beat Jess Willard in 1919, leaving the giant bewildered and shattered. This victory awarded Dempsey both the heavyweight title and the nickname of the "Manassa Mauler, " the name that soon haunted potential opponents all around the country. Dempsey became a ring warrior through his tough defense of his title six times in just seven years. In most of his matches, there were no survivors. A day of disbelief for Dempsey occurred on September 23, 1926 when he was defeated by Gene Tunney and lost his heavyweight title. Ironically, this match yielded the largest paid attendance in boxing history. Tunney and Dempsey went head to head and fist to fist again in 1927 in hopes that Dempsey would reclaim his title. Dempsey lost this rematch, which was coined "The Battle of the Long Count" because of a call by the referee that Dempsey did not return to a neutral corner after Tunney had fallen. Tunney won the match three rounds later.